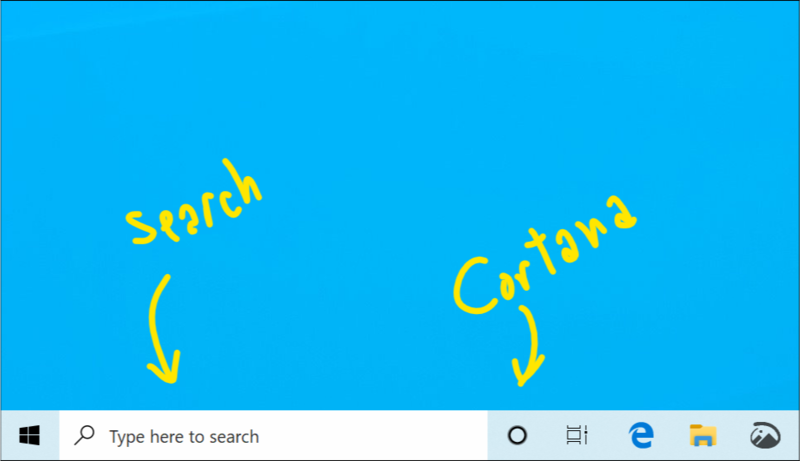 Enlarge / The Cortana button is now no longer part of the search box. Today’s Insider build of Windows 10, number 18317, changes how search and Cortana are used, as Microsoft is working to reposition Cortana as a productivity-focused digital assistant and integrate search with Office 365. Currently, Windows 10 has a single text box on the taskbar that’s used for searches and Cortana commands. Type a word or two and it’ll search the Start menu, settings, and documents. But type a command (“tell me a joke,” say) and no search is performed; instead, the command is delivered to Cortana, and she duly responds. In the new build, the text box is used solely for searching. To give Cortana a command, you’ll have to speak to her or click a separate Cortana button on the taskbar. The combination of the two features was an oft-criticized part of the Windows 10 interface, as there’s no particular reason to bundle them together. Both can respond to typed commands, so using the text box for two different things saved some space. Because searches are popular, it’s likely that some people were introduced to Cortana as a result of a search. Separating the two things should make the Windows interface a little more logical. The settings pages have also been disentangled. Microsoft is promising to make some big changes to its search experience that will be particularly visible to corporate Office 365 users. Searches, whether invoked from Windows, Bing, Office, or Teams will be unified. So no matter where you start your search, they’ll all be able to find, for example, documents in the corporate SharePoint or OneDrive for Business, conversations in Teams or Yammer, or contacts from the company address book. Cortana is not being abandoned, but Microsoft is making changes to give its assistant more focus. For example, the Insider preview version of Windows 10 also includes integration between Cortana, Microsoft’s To-Do app, and Outlook’s tasks. Cortana has long had the ability to set reminders; the integration means that these will now be made visible in To-Do and Outlook. The Cortana button on the taskbar may not be her final home—rumors have been circulating for some months that eventually Cortana functionality will be moved into the Action Center, with Cortana used to handle notifications.